At Fuel Card Services, our people are a top priority. It therefore gives us great pleasure to support this year’s Shell Safety Day, which focuses on the concept of nutrition. In addition to the theme of “nutrition”, our Leeds office continues their support with LeedsMind, a charity organisation which aims to reduce stigma and discrimination associated with mental health. This year’s theme is #GoHomeWell and that means supporting people to be more open and understanding of their mental health needs. The backbone of any business is its staff and therefore supporting individuals to attain the proper work-life balance and to come forward when they feel they are having problems with their mental wellbeing is essential. Overall, one in four people will be affected by mental health issues in their lifetime. This means it is imperative that businesses do all that they can to tackle this issue head on and to dispel any taboo in the workplace around mental health problems. Indeed, figures from health insurance specialist Health Shield show that 49 per cent of all employee absences can be attributed to issues of anxiety, stress or depression each year. 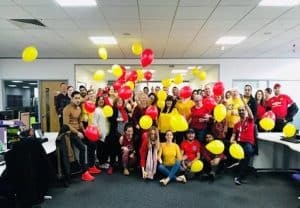 As a result, supporting Shell Safety Day 2019 represents a chance for ourselves and our partners to spread the message that mental health problems should be brought more into the open. Ultimately, it’s an issue that we feel passionately about. We always take seriously the mental health requirements of our staff and Fuel Card Services remains committed to ensuring the best level of support for all who work here.